This new project kept our company busy on different aspects ranging from Standards to Safety, from traditional to technical execution. It also fully demonstrated our seriousness and 360° production skills, the marks of a company that is flexible and ready to face any reality. We did the following: implementation of a medium-voltage cabinet with power wiring, installation of the lighting system with LED lamps to save energy, and an emergency lighting system with a CSS Central Supply System that includes centralised supply through dedicated UPS as indicated in Standard EN 50171. We also created and installed the lighting system outside the warehouse, the fire alarm system, which included various smoke detectors ranging from the traditional system, with detectors in various points for the smaller areas, to linear smoke barriers for the warehouse, and the use of an air intake system for the office building area. 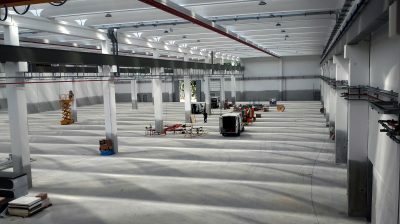 Data transmission completed the system, with more than 20 km of data cable and optical fibres to connect the various racks, in order to manage the more than 300 network points for the industrial warehouse (approximately 8,000 m2) and for the office building (approximately 2,000 m2). The last operation was installing the video intercom system.